I have a confession. I've never really been a fan of "costume" -type jewelry. Perhaps it's less that I've "never been a fan" and more that I've "just never really owned any." Until that is, I stumbled upon Bridier Baubles. Since then, my costume-type jewelry hoard has grown exponentially and I couldn't love it more. Suddenly, I quickly realized I had no where to keep it. As my pretty baubles began spilling over onto The Husband's side of the dresser in our bedroom, I knew it was time to take action. I immediately turned to Pinterest and quickly became dismayed when all of the DIY tutorials I clicked turned out to be dead-end sources. You know, those pins that don't lead anywhere- other than to a general blog or just a .jpg image. What's a girl with too many baubles to do then? Why, take matters into her own hands of course! This project was sublimely simple and took less than 45 minutes to complete from start to finish and it was completed for less than $25.00. - 1 large open frame, size dependent on your bauble hoard. You will decide momentarily if you'd like to hang it horizontally or vertically. Frames are currently 50% off a Hobby Lobby so I scooped up this reclaimed wood-type frame for $15. - Hot glue gun and 4 glue sticks. 1. 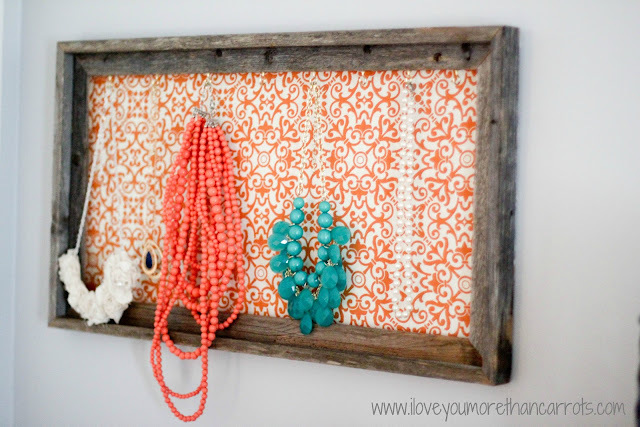 Decide whether you want to hang your frame horizontally or vertically. 2. 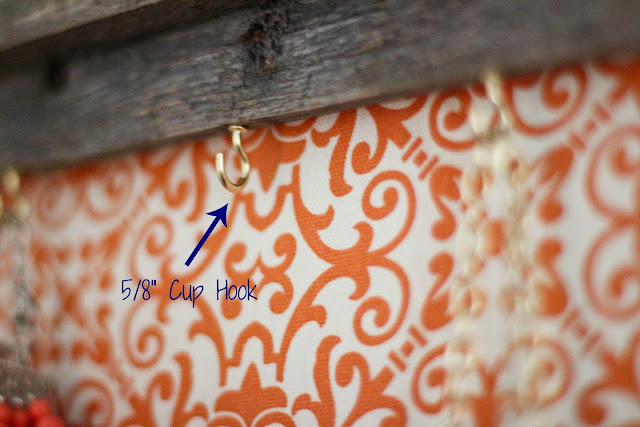 Start by screwing your cup hooks into the underside lip at the top of your frame. Thankfully I chose a frame constructed of a relatively soft material (reclaimed wood). Regardless, this is the toughest and most frustrating part of the project. You'll want to press firmly as you begin screwing in your cup hooks. I used my fingers. You should probably use pliers. In terms of placement, I just spaced them out visually. No real need to measure. You can place them as close or as far apart as you desire. 3. Now, stretch your fabric out across the back of your frame, making sure that the pattern of your choice is framed in the center of the frame. Begin to glue down your fabric by placing a long line of glue across the right side of your frame. Press down your fabric and hold until set. 4. Next, place a line of hot glue along the bottom of your frame. Press your fabric (while stretching tight) down along the line of hot glue. Hold until set. 5. Place a line of hot glue along the top of your frame. Press your fabric (while stretching tight) down along the line of hot glue and hold until set. Do you see a pattern here? 6. Pull your fabric taught, making sure there are no wrinkles or creases anywhere in the frame and place a line of hot glue along the left side of your frame. Press down your fabric and hold until set. 7. Allow project to set for several minutes before hanging. Voila! In less than forty-five minutes and for under $25, an easy DIY project and home for some of your prettiest baubles. Within minutes of completing the project, I raced upstairs to our bedroom and found the perfect spot behind the door to hang my latest craft. 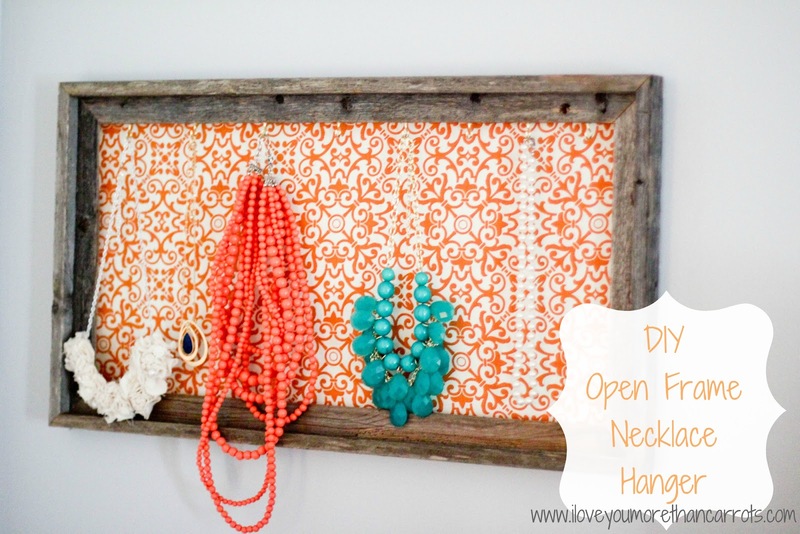 With so many different fabric and frame options, this project is customizable to any decor! Feeling extra crafty today? I'd love to see your finished project! Be sure to come back here and let me know how it turned out! Any questions? Just ask! I haven't been a costume jewelry fan myself, but LOVE Bridier!!!! I definitely find myself indulging in some new fun pieces this year...more than ever before. Oh my! This is so cute!!! I am waiting to find out if we are having a boy or girl to make all of my crafts. If I find out it is a girl, I am totally making this hanger. It looks great! When are you going to start hosting girls craft nights??? Why wait until the kiddies are here for playdates, right? :) I have a list a mile long and it's not nearly as fun doing them by myself! As it is, I am headed to hobby lobby, home depot and ikea for supplies this weekend for a few similar projects to hold headbands and hairclips for the nursery. Eee!!! I love it!! So cute! I love this! Thanks so much for posting. Can I please have 1/4 of your DIY skills? Your too crafty for your own good...and i love it!! It looks great, mama!! So cute!! I am so making this this weekend! !